This is a video every single tax payer shhould watch, beinning to end. It's less than 10 minutes long. You will hear Republicans and Democrats speaking about the two entities responsible for the current financial mess: Fannie Mae and Freddie Mac. This is not spin, and it leaves no doubt as to the blame. The is from four (4) years ago. This crisis could have been avoided. This arrived in my e-mail box this evening. I think it's brilliant. Instead, I'm in favor of giving $85,000,000,000 to America in a We Deserve It Dividend. If we're going to re-distribute wealth let's really do it...instead of trickling out a puny $1000.00 ( 'vote buy' ) economic incentive that is being proposed by one of our candidates for President. I trust my fellow adult Americans to know how to use the $85 Billion We Deserve It Dividend more than I do the geniuses at AIG or in Washington, D.C. I am in awe. This man has profoundly articulated my exact thoughts, and has done so brilliantly on the House floor. Why doesn't this man get the attention he deserves on the evening news? With George Bush soon leaving office, what will Bush bashers do with themselves? If Sarah Palin is elected vice president, it appears they will target her. Already, with the help of the media, they have managed to obfuscate the record of John McCain's vice presidential nominee and create a string of myths about her. To set the record straight, here are the chief myths, along with the facts. Myth: As governor of Alaska, Palin put the governor's plane up for sale on eBay but did not really sell it. Fact: After she did not find a buyer on eBay, she sold the plane eight months later through a broker for $2.2 million. Myth: Palin did not really stop the "Bridge to Nowhere." Fact: During her gubernatorial race in 2006, she endorsed the bridge but as governor rejected it, allocating the federal earmark money elsewhere. Meanwhile, in 2005, Barack Obama voted against a Senate amendment to stop funding for the project. Myth: As mayor of Wasilla, Palin banned nearly 100 books, including "The Adventures of Tom Sawyer," "The Adventures of Huckleberry Finn," and "Death of a Salesman." Fact: Palin never banned any books. An emailed list of books she supposedly banned included Harry Potter books that had not yet been published when she was in office. Myth: Palin fired her public safety commissioner because he would not terminate a trooper who was her former brother-in-law after he had been suspended for five days for misconduct. Fact: Palin did want Walt Monegan to fire her former brother-in-law. But extensive emails from Palin and her aides show she was upset with him because he repeatedly defied her instructions on a string of budget requests. He was offered another job but declined to take it. Myth: Palin cut funding for special needs education by 62 percent. Fact: Funding for the program in question was actually tripled thanks to legislation signed by Palin. Myth: Palin wanted Alaska to secede from the U.S. Fact: A member of the Alaskan Independence Party incorrectly told the New York Times that Palin at one time had been a member. She later recanted this claim and issued a public apology to the governor. Myth: Palin left Wasilla residents disenchanted with her. Fact: In subsequent elections, Wasilla residents voted for Palin by 70 percent or more. Myth: Palin has no experience. Fact: Sarah Palin has a string of accomplishments to show for her herself. As mayor, she cut property taxes by 75 percent and reduced her own salary by 10 percent. After joining the Alaska Oil and Gas Conservation Commission in 2003, she led an ethics probe of the commission's chairman, Randy Ruedrich, who also was the state GOP chairman. Facing conflict-of-interest-allegations, Ruedrich admitted ethics violations and resigned. Besides opposing the $400 million "Bridge to Nowhere," Palin as governor used her veto power to cut nearly $2 billion from the state budget. She was successful in enacting ethics reform legislation. While pushing to develop more energy resources, she reformed the system for paying Alaskans royalties from oil production. That will enable her to deliver a rebate of $1,200 — in addition to $2,069 in dividends — to each resident of the state. I will let the article from Bloomberg speak for itself, although I will mention that I echoed some of these same thoughts yesterday in RickG's blog. Ever wonder what a 500 carat near-flawless diamond looks like? 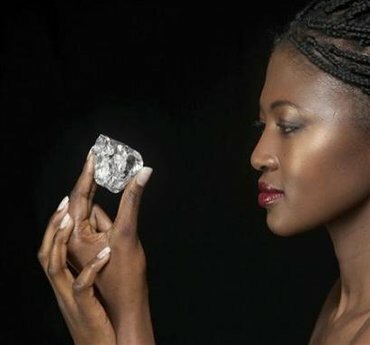 The world's largest diamond is the Cullinan, discovered in South Africa in 1905. It weighed more than 3,100 carats before it was cut into more than one hundred separate gems, many of which are part of the British crown jewels. Wow, Chevy's new Volt electric car, coming out as a 2010 model (so I guess next summer or fall), looks fantastic! The video is really clever and fun to watch. The car itself looks really nice, which is such a refreshing change. I am tired of the ugly designs chosen by the Japanese automakers for their electric cars. Why do they have to make electric cars ugly? To hold back demand? The Volt is designed to plug into a regular household outlet (nice!) and will go for 40 miles without a drop of gas. The web link above has more info — check it out! Are you confused by the Fannie Mae/Freddie Mac crisis? Fred Thompson recently wrote a terrific overview of what this crisis is, the root cause of it, and why the entire thing is dangerous. I'll bet it came as a surprise to most folks that the financial stability of the world as we know it depends upon the survival of a couple of outfits called Fannie Mae and Freddie Mac. Yet that's what the so-called experts are telling us. Moreover, we taxpayers are now being asked to guarantee Fannie and Freddie's tab, one that could make the $124 billion S&L bailout of the late 1980s look cheap. So how did we get stuck with this bill? Well, Congress wanted to "do something" about what it saw as a "housing problem." To them that meant that they should create an even bigger problem. So Congress passed laws that made it easier for hopeful home-buyers to buy houses ... even when they couldn't afford them. Then the Fed and other regulators helped, in the form of easy money and loose credit standards for mortgages. Then an amazing thing happened - apparently impossible to foresee. Home prices did not continue to rise forever! Home prices came down and easy money dried up, causing the above mentioned cycle to reverse. In other words, the bubble burst. So you'd think the in-over-their-heads homebuyers and the mortgage bankers would take the hit, and the market would right itself. No reason for an international meltdown here, right? Not so fast my friends. Years earlier Congress established Fannie and Freddie as purchasers of these mortgages, which they could bundle up, repackage and sell to investors, freeing up more mortgage money. As government creations tend to do, the two companies grew until they either owned or guaranteed about half the nation's $12 trillion dollars in mortgages. Fannie and Fred were "government sponsored enterprises" which means heads they win, tails you lose. If they make money stockholders, creditors and Fannie and Freddie employees - some making millions annually - get the benefit. But now that mortgages have hit the skids, with mounting losses, the taxpayers potentially face trillions in exposure. This is because there is an "implicit" (read "actual") government guarantee of Fannie and Freddie's obligations and both are now too big to be allowed to fail. This is called the "bailout phase," which will probably lead to a bigger bubble in the future. In Fan and Fred's case, it was in no one's interest to turn off the bubble machine. Just the opposite. The system induced borrowers to take on financial obligations they could not afford and lenders to lower lending standards. Fannie and Freddie went along because their managers' compensation depended on the firms' short term financial performance. And investors continued to buy complex security packages they didn't understand, because the securities were viewed as government-backed. You'd think we'd have learned by now: when the backstop of the federal treasury makes it easier for politicians, lenders, borrowers, welfare recipients, government contractors, or anyone else, to serve their own self interest at the expense of the taxpayer, many will do just that. Our Founding Fathers knew more than a little bit about human nature. It is one reason why in the Constitution, the federal government was given certain delineated powers and no others. I hate to burst another bubble, but our government simply doesn't have the authority or the capability to be the guarantor or insurer of our every need or desire. Isn't it time we started sending that message loud and clear to the big enablers in Washington? Greta Van Susteren did an excellent one-hour show about Sarah Palin that aired on Sunday. For anyone wanting to know about her background, it's the best background material I've seen. That is most certainly because Greta is among the best investigative journalists anywhere — entirely detached and non-partisan. Greta is always able to pull together new information from a variety of sources, because people are always glad to speak with someone who is non-partisan, as she is. The entire show is available in 5 parts on YouTube, and I've included links below to each of the 5 parts. (No commericals!) Definitely worth the time to view. It includes an absolute TON of new, very personal footage. Lots of video taken at home with her husband and family, and lots of video of her in her mayor and city council days. Interspersed with new interviews of Geraldine Ferraro, providing some insight on runing as a woman on a national ticket. This news story shall speak for itself. My favorite line from the Atlantic is, "We don't vet our photographers by their politics." Um, OK, well how about vetting them by their disgusting behavior? I need to know if she really thinks Dinosaurs were here four thousand years ago; I want to know that, I really do, because she's going to have the nuclear codes. This video is typical of the left-wing Hollywood know-nothings. It's a great example of how these people think. It's probably also a great example of how some of the bloggers here think. This is the kind of crap commentary that will cause people to rally to the side of decency and common sense. Where is Matt's wonder at Obama's sudden rise to glory? Since Obama's rise happened with absolutely no executive experience, would it not be a better example of a "Disney movie"? I guess Matt Damon feels comfortable ridiculing a "hockey mom". Pacattack05 posted a video of Governor Palin that showed her when she was starting her former career as a broadcast journalist. The implied message is, "She is nothing, has no experience, and is not qualified to be VP." Another implication certainly must be that Obama is highly qualified, since it would not make much sense to attack Governor Palin in that manner unless the person posting the video felt they were standing on solid footing. Governor Palin is not only a highly-qualified candidate for VP, but has better credentials than the presidential candidate on the other side. For those who have installed Google's new "Chrome" (I really don't like that name) Web browser, there is already the first update available, but you may not be aware of it. I have read about a major security flaw in the browser lately, so I was surprised when I did not see the browser "update itself" at some point. I just happened to be poking around in the interface and noticed a small message at the bottom of the "About" window stating that an update was available. Click the button in the upper-right corner with the "wrench" symbol on it. Select "About Google Chrome" from the menu. At the bottom of the About window (to the left of the OK button) you will see a message that either states that the browser is up-to-date, or that an update is available. The new version is 0.2.149.29 (build number 1798). Nearly 39 million people watched Republican presidential candidate John McCain's acceptance speech on the closing night of the GOP convention Thursday in St. Paul, Minn. That broke the week-old convention record of upwards of 38 million viewers set by Sen. Barack Obama only the week before. Sen. McCain amassed an audience of 38.9 million viewers for his speech on two fewer channels than were carrying Sen. Obama's speech Aug. 28 to 38.38 million viewers, according to data from Nielsen Media Research. In addition to the three broadcast networks and three cable news networks carrying both closing speeches, Sen. Obama's speech was carried live by BET and TV One, which target African American audiences, as well as Spanish-language Telemundo and Univision. Sen. McCain's speech was carried by Telemundo and Univision. Sen. McCain's audience dwarfed the 25.57 million who tuned in for President Bush's acceptance speech on closing night, Sept. 4, in 2004.